The global chicken production is on an increasing trend since the chicken meat makes for an affordable protein source. An OECD forecast estimates that poultry in general will overtake pork as the meat market leader within the next decade (FAO 2014). This example focuses on the chicken production, but identical reasoning pertains to most meat productions systems (such as bovines and sheep). This chicken production has six co-products (see table ). Table: Co-products of chicken production, data from FAO LEAP 2014. The dark meat, breasts and wings are what we normally would consider the primary output. There is only one way to obtain these chicken cuts – namely through poultry production. 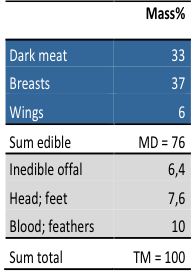 These three by-products (dark meat, breast and wings) must be deemed determining co-products since neither of them have an alternative production route. The other three co-products (Inedible offal, Heads and feet, Blood and feathers) enter the market for pet food production, where alternative raw materials (mainly soy protein) are available. Therefore they can be identified as by-products to be handled by system expansion in the normal way. To identify the consequences of an isolated increase in demand for each of the three determining by-products we must analyse each of these separately. The actual further modelling of this chicken abattoir example is described in another example. This example is based on FAO LEAP (2014) poultry data (US-data).